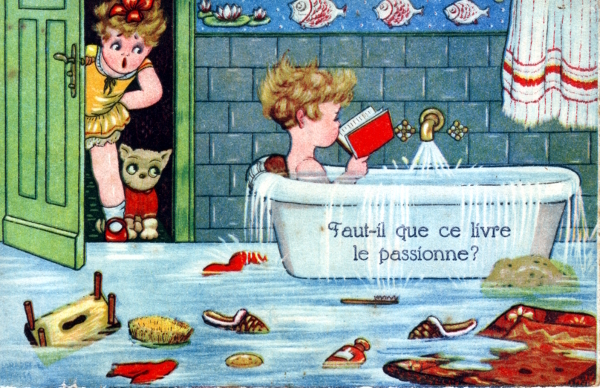 Vintage Postcard Gallery: Blog Action Day 2010 – Water! This is a vintage postcard blog entry with a difference! Today - 15 October 2010 - is Blog Action Day, when tens of thousands of bloggers from over 125 different countries around the world join together to write a post about one important topic. This year the focus is on water. Nearly 1 billion people across the globe lack access to clean water, which inevitably leads to horrendous hardship, preventable diseases and even death. Of course, the sad truth is that almost all of us in industrialized countries are guilty at some time or another of water over-consumption in our daily lives. Whilst people living in the developing world face a water crisis, we consume far more than our fair share. The simple truth is that we can all make small changes that collectively make a huge difference: from turning off running water whilst brushing our teeth, to spending less time in the shower. And if we take a bath, let's keep the water level low, and consider re-using the water in our gardens before we let it all go down the drain. This vintage French postcard was printed using the offset lithographic method - in fact the colours are very slightly out of register and it has a dull surface. It was imported from Germany and published by Rokat (Robert Kathmann of Leipzig), probably during the 1930s. Its image of an oblivious reader caught up in a gripping book whilst sitting in an overflowing bath seemed to fit very well with the water wasting theme of this post! Today is also Postcard Friendship Friday too of course! Thanks for participating! Take a look at ny article when you have a minute! I didn't know about blog action day, or I would have joined in--what a lovely postcard! I enjoyed it VERY much! lol Reminds me of my kids when they were young. Thank you for taking part in Postcard Friendship Friday! Great post! Thanks for reminding me of Blog Action day, too! I had no idea about Blog Action Day! Wonderful! Great card and great idea. Happy PFF, too! Sweetly funny card, although overflowing bathes can be a horror. Water is an important social theme. Wells and fountains should be free available - everywhere, anytime, to everyone. Happy PFF and Blog Action Day! Cute card, love all the things floating in the water. Great to spread the word about Blog Action day. I learnt of it through another blog, too late for PFF, happily I indulge in two blogs. You could not have found a more appropriate card for this blog action day. You only realize how much water you waste when the water is turned off for repairs. I know that in our house we could probably cut our water consumption in half if we tried. I didn't know about blog action day either - and I teach environmental themes! I had no idea there was a Blog Action Day. How did you find out about it? A good cause, too. A great card that follows the theme quite well! I hadn't heard of Blog Action Day either. Great topic though. My favourite charity is WaterAid. I wasn't aware of Blog Action Day - I'll certainly look for the Action Day next year. Great post - doing double duty with one really great postcard!